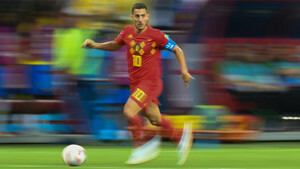 Barça: "If it isn't Hazard, then who else?" As of right now, FC Barcelona's primary target is Chelsea and Belgium star Eden Hazard. This is what people close to the club have confirmed to SPORT. Barça: "¿Y si no es Hazard, quién?" "And if it isn't Hazard, who else is it going to be?" was the answer to the question asked. Barcelona want to reinforce Ernesto Valverde's squad, which returns to preseason training today, with the objective being to win the Champions League again. In order to do that, the intention is to hand the coach a more complete and competitive squad than the one he had last season. Barcelona dominated the domestic scene, winning LaLiga and the Copa del Rey, but weren't capable of matching that in Europe and went out to Roma in the Champions League. At the moment, Barcelona have signed Arthur Melo to cover the loss of Paulinho Bezerra. He should add more technical quality to the midfield area as opposed to muscle. This appears to be the direction the club wants to take when it comes to their other signings. Philippe Coutinho has shown his quality and ability to cause damage from both the left wing and behind the striker at the World Cup. But he's also capable of playing alongside players with a similar profile to him. Alongside Marcelo and Neymar they formed a trio which was lethal. In that regards the addition of Hazard wouldn't be a problem, and less so now than Andres Iniesta has left the club. In Barcelona's greatest moments they had Xavi, Iniesta, Cesc and Messi who moved the ball around and then David Villa and Pedro who would attack the spaces looking to score the goals. Muscle and physicality wasn't needed. Barça had put aside €100m for the failed 'Operation Griezmann'. Antoine signed a new deal at Atletico Madrid and now Barcelona are forced to look for another top quality reinforcement. Tottenham's Danish midfielder, Christian Eriksen, is also on the list of targets but Barcelona consider Hazard to be operating at a higher level than him. Also, while Spurs' intentions are to consolidate their project, Chelsea are at the point of overhauling their squad. Maurizio Sarri is expected to replace Antonio Conte as the Blues didn't qualify for the Champions League this season. One point in Barcelona's favour is that Hazard, who has an existing deal which runs until 2020, hasn't accepted the contract offer on the table from Chelsea.